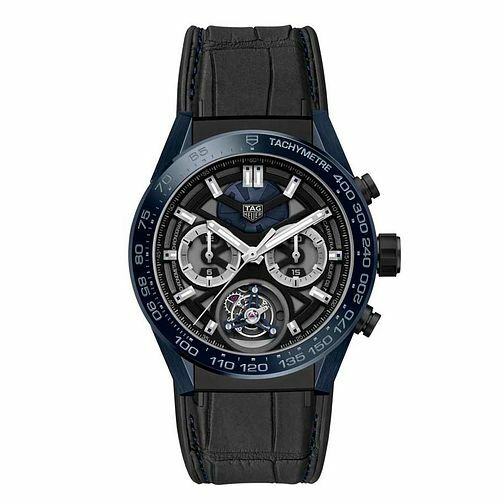 Inspired by motor racing, the Tête de Vipère sports watch by TAG Heuer offers a contemporary take on the classic design. A blue case presents a bezel with tachymetre scale and a bold black dial. A trio of counters present a skeleton display upon this swiss made timepiece with automatic calibre. A black alligator leather and rubber strap combines comfort with style, and is finished with a black titanium folding clasp. This watch boasts water resistancy up to 100 metres.